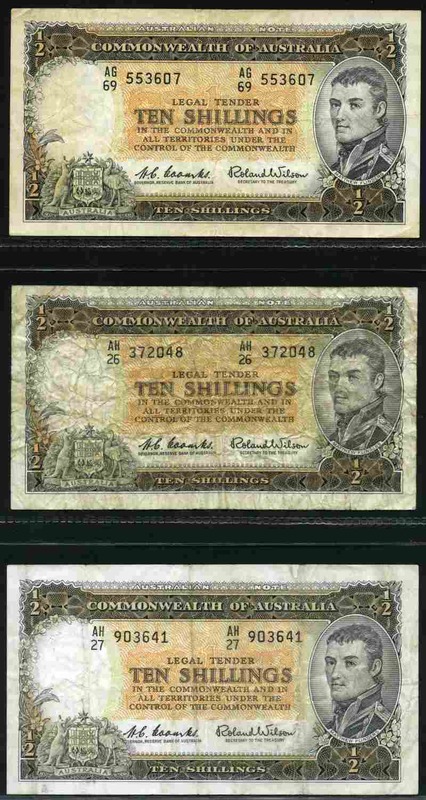 1919 10/- (Half Sovereign) Cerutty/Collins KGV Banknote with Bold Prefix numbers poor VG. 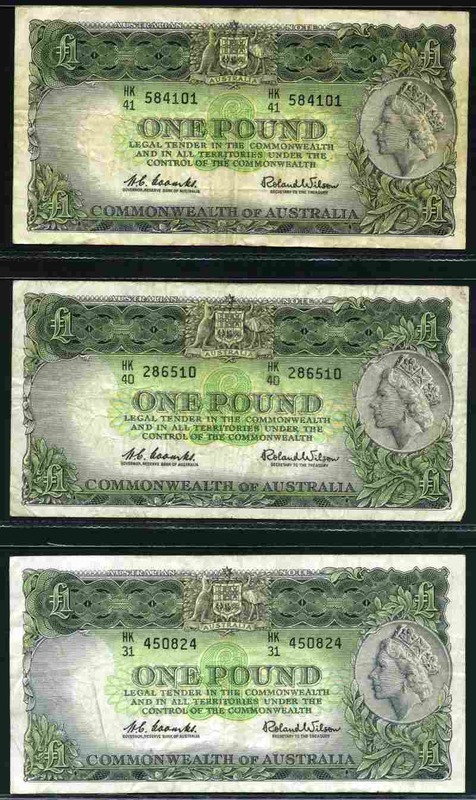 Serial No M 305305 L. Also 1952 10/- Coombs/Wilson KGVI, 1961 10/- Coombs/Wilson Reserve Bank QEII, 1933 £1 Riddle/Sheehan KGV, 1960 £5 Coombs/Wilson Reserve Bank QEII and 1960 £10 Coombs/Wilson Reserve Bank QEII banknotes VG. McDonald 10, 23, 25, 44, 72 and 86. 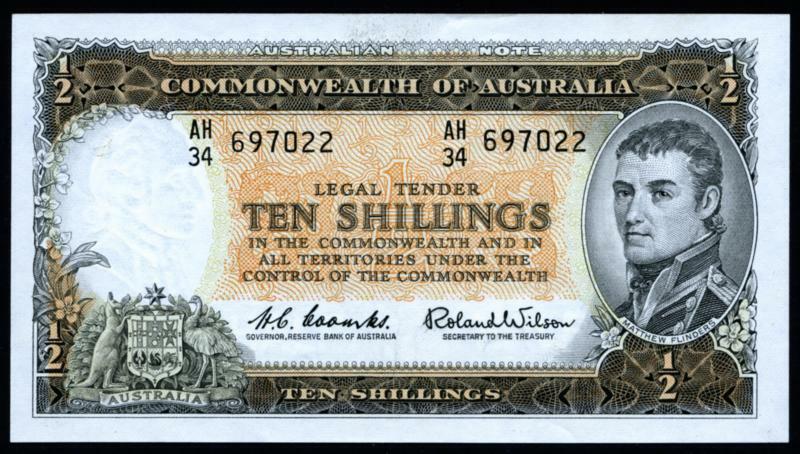 1936 10/- KGV Riddle/Sheehan, 1942 10/- KGVI Armitage/McFarlane, 1961 10/- QEII Coombs/Wilson Reserve Bank, 1927 £1 KGV Riddle/Heathershaw, 1933 £1 KGV Riddle/Sheehan, 1953 £1 QEII Coombs/Wilson Commonwealth Bank, 1939-49 £5 KGVI Sheehan/McFarlane and Coombs/Watt, 1960 £5 QEII Coombs/Wilson Reserve Bank and 1943 £10 KGVI Armitage/McFarlane banknotes VG. McDonald 19, 21, 25, 41, 44, 50, 67, 69, 72 and 82. 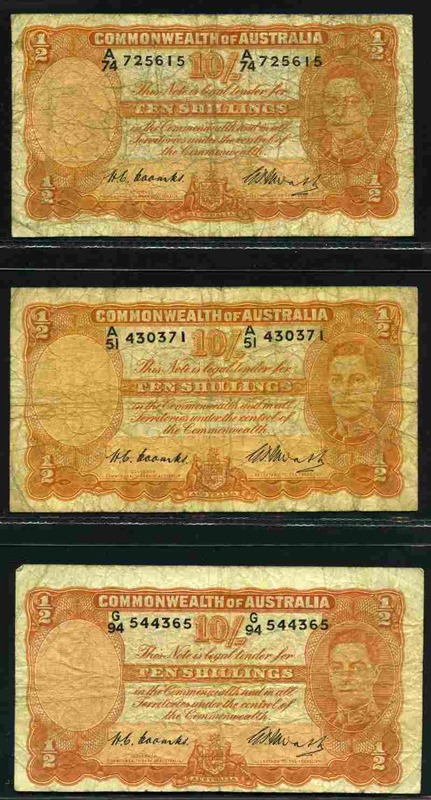 1936 10/- KGV Riddle/Sheehan banknote F. No tears. Serial No D37 610950. McDonald 19. 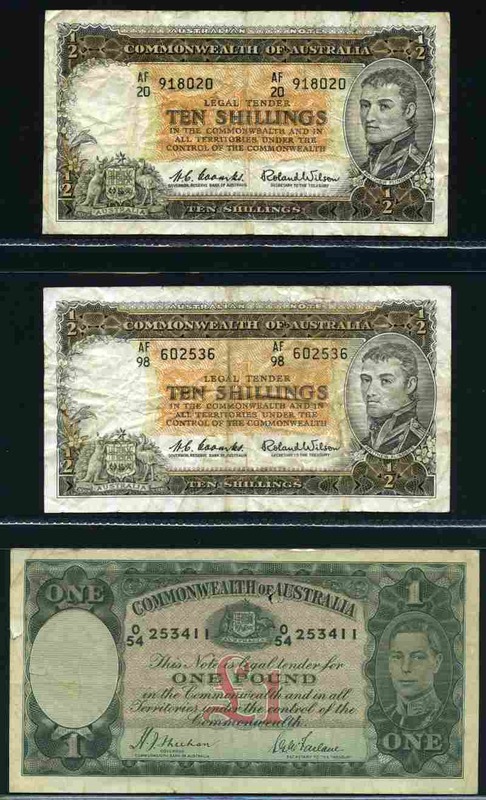 1939 10/- Sheehan/McFarlane and 1942 10/- Armitage/McFarlane KGVI Banknotes, cleaned and pressed. Graded VF. McDonald 20 and 21. 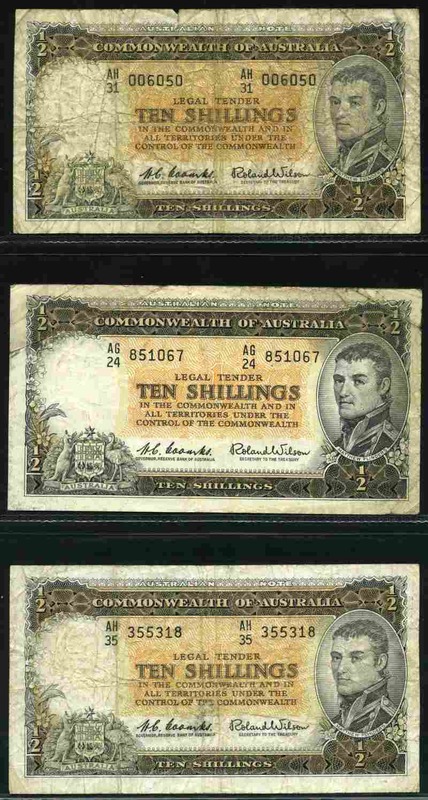 1942 10/- Armitage/McFarlane and 1949 10/- Coombs/Watt KGVI Banknotes. Minor staining, graded F. McDonald 21 and 22. 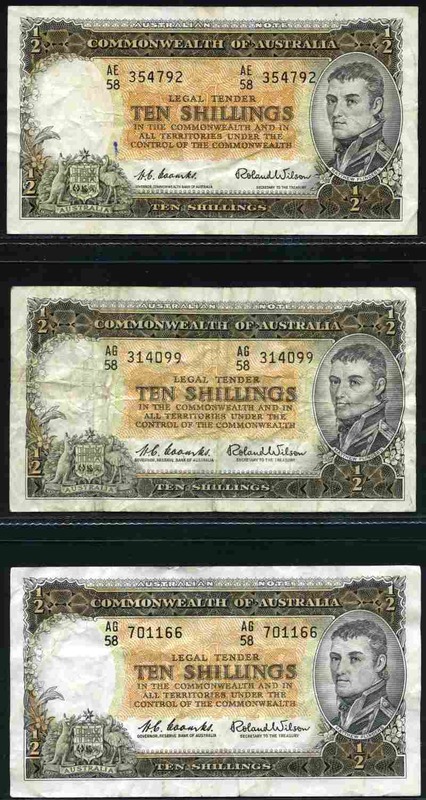 1942 10/- KGVI Armitage/McFarlane (2), 1949 10/- KGVI Coombs/Watt (5, one Last Prefix), 1952 10/- KGVI Coombs/Wilson, 1954 10/- QEII Coombs/Wilson Commonwealth Bank (5), 1961 10/- QEII Coombs/Wilson Reserve Bank (10, one First Prefix), 1938 £1 KGVI Sheehan/McFarlane (2), 1942 £1 KGVI Armitage/McFarlane dark green main print (3), 1949 £1 KGVI Coombs/Watt, 1952 £1 KGVI Coombs/Wilson (2), 1953 £1 QEII Coombs/Wilson Commonwealth Bank (3), 1961 QEII Coombs/Wilson Reserve Bank dark green reverse (2) and emerald green reverse (4), 1952 £5 KGVI Coombs/Wilson, 1960 £5 QEII Coombs/Wilson Reserve Bank, 1943 £10 KGVI Armitage/McFarlane and 1954 £10 Coombs/Wilson Commonwealth Bank banknotes VG. (44 Banknotes). McDonald 21, 22, 23, 24, 25, 45, 46, 48, 49, 50, 51, 52, 70, 72, 82 and 85. 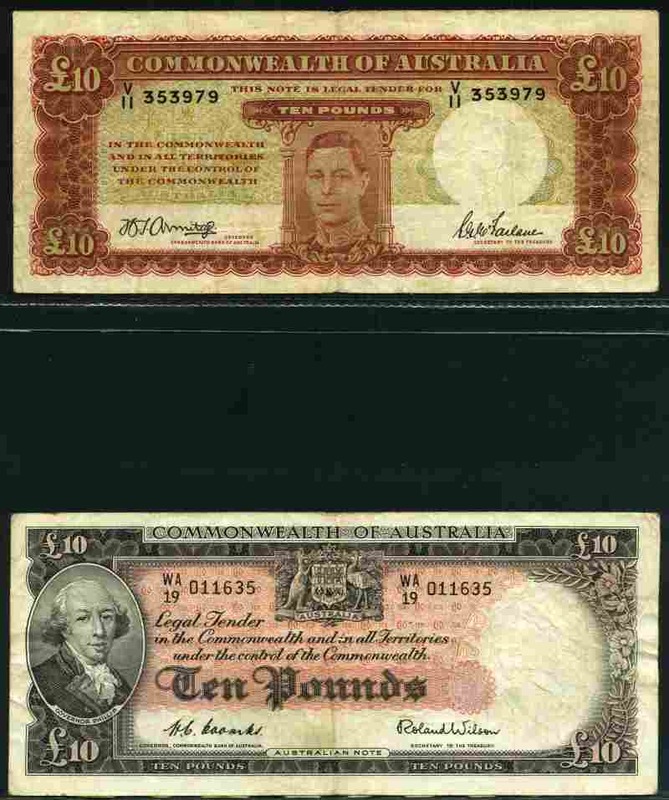 1949 10/- KGVI Coombs/Watt, 1952 10/- KGVI Coombs/Wilson, 1961 10/- QEII Coombs/Wilson Reserve Bank (2), 1952 £5 KGVI Coombs/Wilson, 1960 £5 QEII Coombs/Wilson Reserve Bank, 1943 £10 KGVI Armitage/McFarlane (V5 First Prefix) and 1954 £10 QEII Coombs/Wilson Commonwealth Bank (3) banknotes VG, plus 1967 $1.00, $2.00, $10.00 and $20.00 Coombs/Randall banknotes F. McDonald 22, 23, 25, 70, 72, 82a, 85, 102, 122, 162 and 182. 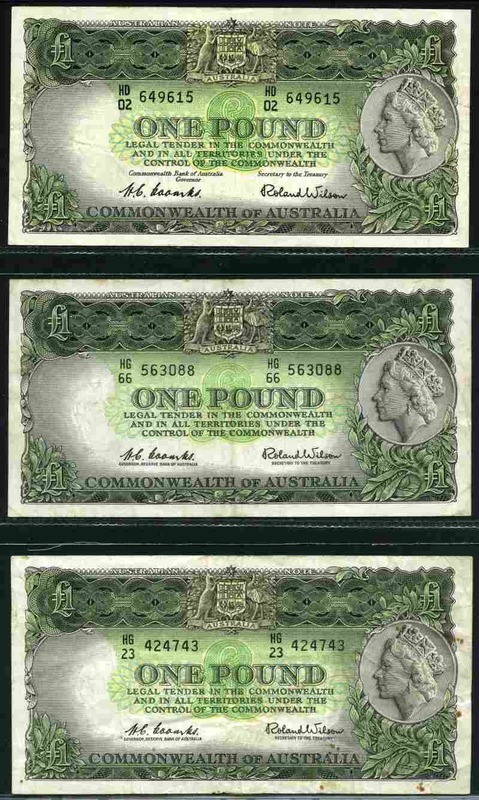 1952 10/- and £1 Coombs/Wilson KGVI Banknotes VF. £1 note with faint ink mark over Coombs signature. McDonald 23 and 49. 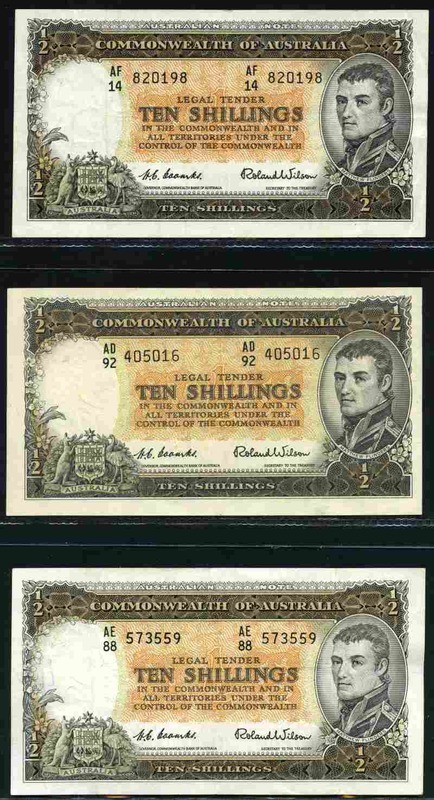 1961 10/- Coombs/Wilson Reserve Bank consecutive pair QEII Banknotes, cleaned and pressed. Graded VF. McDonald 25. 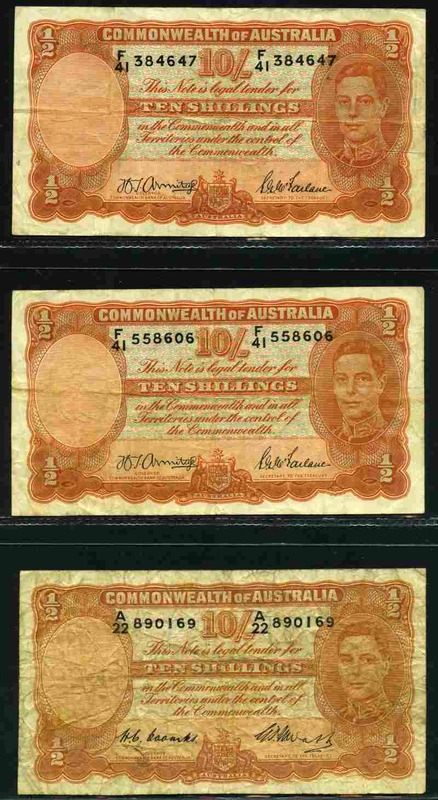 1961 10/- Coombs/Wilson Reserve Bank QEII Banknote aUnc. McDonald 25. 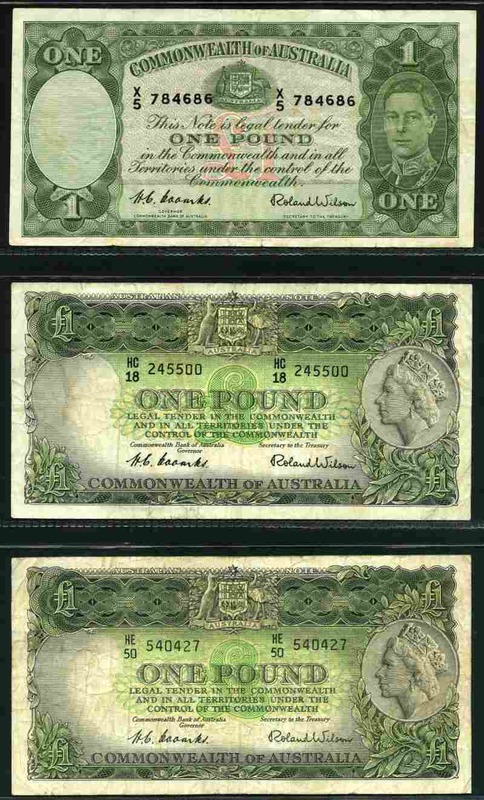 1942 £1 Armitage/McFarlane Dark Green Print consecutive pair KGVI Banknotes gVF. McDonald 46. 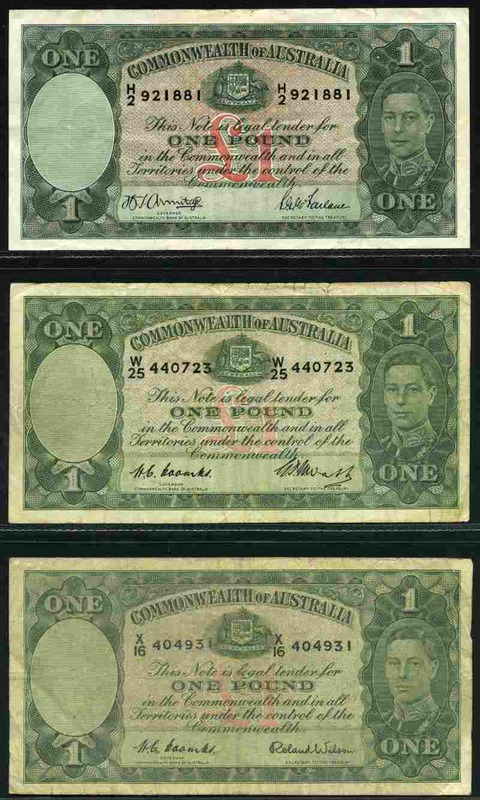 1949 £1 KGVI Coombs/Watt banknote gEF. Serial No W47 125370. McDonald 48. 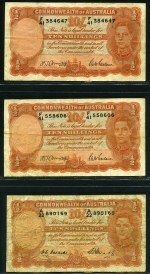 1952 £1 Coombs/Wilson consecutive pair KGVI Banknotes. Minor staining, graded gF. McDonald 49. 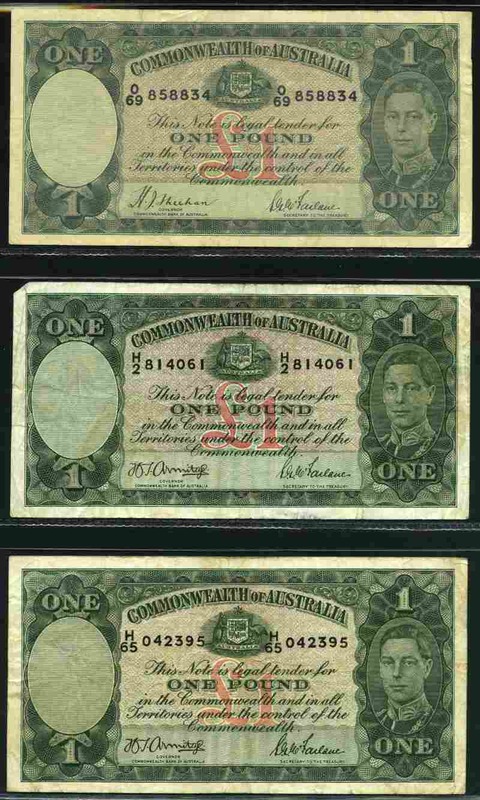 1952 £1 Coombs/Wilson Banknotes VF. (2). McDonald 49. 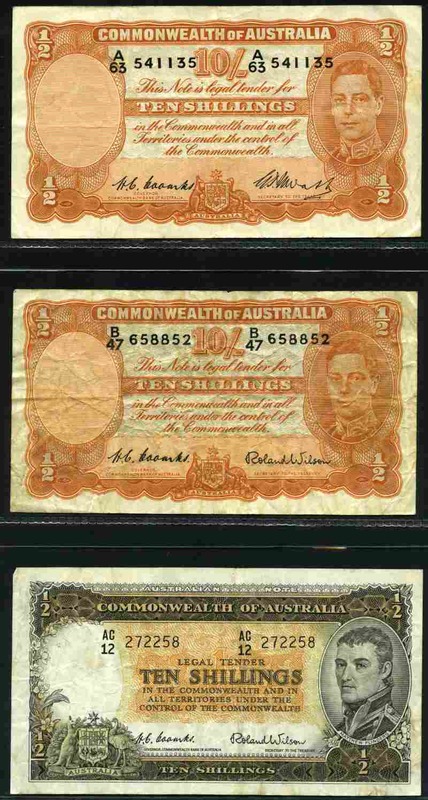 1953 £1 Coombs/Wilson Commonwealth Bank consecutive pair QEII Banknotes aUnc. McDonald 50. 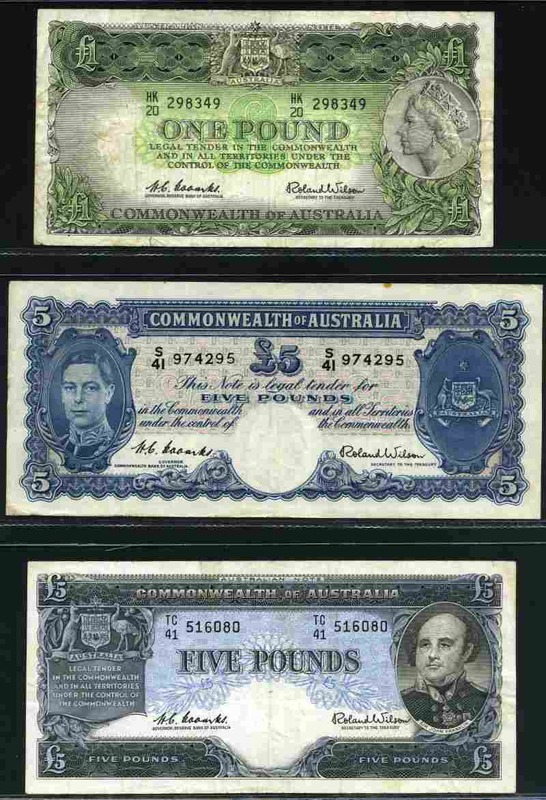 1941 £5 Armitage/McFarlane KGVI and 1960 £10 Commonwealth Bank Coombs/Wilson QEII Banknotes, cleaned and pressed. Graded VF. McDonald 68 and 86. 1960 £10 Coombs/Wilson QEII Banknote, cleaned and pressed. Graded VF.